This Dress Form design is a stunner. We love its simplicity and natural adornment – like a real Christmas tree, only in formal attire. The frame is made of chicken wire, laced with layers of different types of greenery – in different shades. This is definitely one to make your fete festive. This Mannequin Christmas Tree is made using a partial silhouette. Starting with the longest evergreen boughs, the branches are pinned to the mannequin using floral pins. The “dress” is finished with a burlap bodice, and dressed with a festive bow and an elegant pearl necklace. Happy holidays! 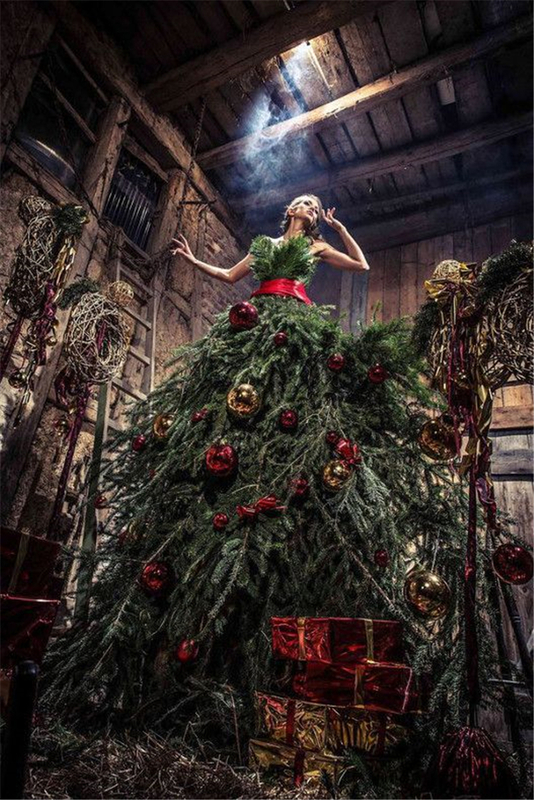 Believe it or not, this Dress Form Christmas Tree was made using pine, cedar with red berries, which were cut from a backyard. Adding the crochet collar gives this piece an antique look, finished with a crown of lush greenery and berries. LED lights make this design really sparkle.